In Anon's most recent reply, he focuses largely on the issue of explaining why "the concepts we need to learn first are just the ones whose referents have the most obvious perceptual similarities." I'll leave it to cognitive scientists (including those mentioned by Anon, along with others) to determine the degree to which this part of the theory accords with reality. In the meantime, I want to focus at what I consider the chief point at issue: the hierarchy as a theory of justification. As Anon admits, the theory attempts "to show how abstract reasoning connects to perceptual evidence." Does it really? But how can that possibly be? At the very most, it only shows how the concepts in use among propositions relate to perceptual evidence. However, abstract reasonings are used to formulate theories; and under no circumstances is it plausible to conclude that a theory can be justified merely by showing "how one's higher-level concepts (and associated propositions) derive from lower-level concepts." Knowledge about very complex aspects of reality — knowledge of economics or politics, for instance — is expressed in theories, and theories are more than the sum of their concepts or the logic of their propositions. It is entirely possible that a theory could be made up of valid concepts and pristinely logical reasoning yet still fail to accord with important facts. The reason for this is quite simple: social theories are (and must be because of the complexity of the subject matter) based on simplified premises. Economics, for instance, seeks to understand what would happen under simplified conditions never realized, but often closely approached in practice. Knowledge of reality involves achieving human scale, and that will sometimes involve a certain degree, hopefully within tolerable limits, of cognitive inadequacy. Sometimes the best we can hope for in a given branch of knowledge is merely to achieve a tolerable degree of plausibility. Rand does not appear to have accepted the notion that theoretical knowledge of subjects like economics and politics might be characterized by a unspecifiable degree of uncertainty. She presented her own notions on these matters as if they were quite obviously the certain conclusions of reason, which any rational and moral person would accept as a matter of course. And she appears to have believed that her validation of concepts, of which the hierarchy theory (along with measurement omission) is a critical part, removed any problems related to the possible distorting effects of condensation. Nor, sad to say, does she appear to have confronted the problems of the actual simplification that takes place in the process of devising the premises of theories. The hierarchy of knowledge does not, and cannot, address this issue, since the problem has nothing to do with whether the concepts (or even the propositions) are "connected" to reality, since the way in which any really sophisticated theory "connects" to reality is far too complicated to be tested by tracing its concepts back to their perceptual concretes. Theories "model," in greatly compressed form, certain aspects of reality. When we talk about theories or concepts or propositions being "connected" to reality, we are speaking metaphorically, not precisely or literally. Theories don't mirror reality; they reduce an immense complexity to human scale, so that the mind can get some inkling of that complexity. Theories of complex phenomena are not proved or corroborated or justified by tracing their concepts back through a hierarchy to their "perceptual base." Perhaps that would be possible with something really simple, like a theory of furniture. But it's not in the least possible if we are talking about the theory of the fall of the Roman Empire, or an economic theory of tariffs, or a theory of the circulation of elites within a socio-political system. So how do we know if these theories are true if you can't connect them back through the "hierarchy" to the perceptual base? Science uses rigorous empirical testing to corroborate the conclusions of a theory. No need to trace anything back to the perceptual base from which reasoning proceeds; no, simply test the conclusions! Much simpler, and far more convincing. But there are situations when, because of the inability to run experiments and isolate variables, such empirical tests can hardly be considered conclusive. In economics, for instance, one can't provide entirely convincing empirical tests "proving" that, under all conditions, tariffs will reduce the total output of an economy. The most you can hope for in fields of study where empirical tests yield ambiguous results is to attempt to determine, on the basis of abstract reasoning from simplified premises, what is likely to be true or plausible. Certainty (or near certainty), whether of a contextual variety or otherwise, does not appear possible in such disciplines. Now, the belief in an epistemological theory that promises what it can't deliver will likely lead to cognitive mischief. The danger is that the theory will give its proponents an unjustified confidence in "abstract reasoning." Even if the intention of the hierarchy is merely to justify so-called "justified" speculation, if the theory does not deliver on its justificationist promises, it will likely lead its proponents unwittingly down the primrose path of rationalist speculation. Isn't this what we find in Objectivist thought — unjustified speculation run rampant, yet all done with the most naive sort of cognitive innocence? Rand herself made any number of assertions about matters of fact that are grossly implausible, and yet she seems to have made them with an entirely serene and untroubled epistemological conscience. For example: "Man is born with an emotional mechanism, just as he is born with a cognitive mechanism; but, at birth, both are 'tabula rasa.'" "Emotions are the automatic results of man’s value judgments integrated by the subconscious." "Emotions are not tools of cognition." “[A man’s] body will always follow the ultimate logic of his deepest convictions.” "A man is a ... being of self-made soul." These statements are not presented as possible conjectures or yet-to-be-proved hypotheses, but as veritable certainties. Some of the statements are very likely false. You would be hard pressed to find any scientist acquainted with the relevant evidence who believes in the blank slate model of human nature advocated by Rand. Nor are Rand's views of emotions any better supported by scientific evidence, as Damasio, among others, has discovered. Her statements relating to human nature are, in the light of evidence compiled in genetics and cognitive science, immensely implausible. Her justificationist epistemological theories have here let her down! Instead of leading her to truth and enlightenment, they have mislead her into error and delusion! I don't see among Rand or her followers any appreciation for how difficult it is to determine the veracity of certain types of truth claims. Too much confidence is placed in reasonings based on vague generalities or insufficiently detailed understanding of the subject at issue. The consequence is a philosophy characterized by an overabundance of implausible and semi-plausible assertions. My suspicion is that Rand's justificationist theories, including her hierarchy theory, by giving her an unwarranted confidence in her own reasoning abilities, served merely to fortify her rationalistic and dogmatic tendencies. An anonymous poster has provided to reply to my previous attack on the Objectivist hiearchy of knowledge, as advanced by Van Damme in her polemic against classical education. Since this response is by far the best challenge we have ever received at ARCHNblog, I think my response deserves a separate post. Against my criticisms of the Objectivist hiearchy of knowledge, Anon's main point is that "AR did not think that the most basic concepts were the narrowest possible." This is a entirely valid contention, and will help clarify my criticism of Rand's theory. Although my criticism did focus on the issue of narrowness, that's because that was the thrust of Van Damme's argument. But the broader issue was whether there exists, as Van Damme inserts, a proper order in which concepts should be taught, and, most critically, whether its the width or narrowness of a concept, rather than the complexity of the concept's referents (i.e., the complexity of the subject matter) that determines that order. I can agree with the former, but not the latter contentions. The degree of width of a concept, or the abstractness of it, is an entirely adventitous notion. Where would you place, in your hiearchy of knowledge, the concepts of quantum mechanics? Are they wider or narrower concepts? Why does it even matter? It is enough to know that subject matter of quantum mechanics is immensely complicated, and thus must only be taught to very mature and advanced students. It is important to understand that when Rand admits that individuals "may learn ... concepts in different orders," she is in effect undermining the relevancy of her theory. If "basic" (or "first level") concepts can exist in different places within the hierarchy, why is the hierarchy so important? A Rand quotation provided by Anon supplies the answer: note the distinction Rand makes between "objects you perceive directly in reality and can point to, and [objects] which you have to differentiate by means of other concepts." In other words, Rand is contending that some concepts are grasped by pointing at something in reality, while other concepts are only grasped through other concepts (by a process of thought or by "reason"). The purpose of this theory, I strongly suspect, is to justify philosophical speculation. Rand is contending that, provided that your concepts are "correctly" integrated within the hierarchy of knowledge, it is possible to attain certain knowledge merely by reasoning about "second level" concepts. This is really the ultimate raison d'etre of the Randian hierarchy of knowledge: to demonstrate the cognitive efficacy of philosophical speculation. Unfortunately, since there is no reliable test for distinguishing between "properly" integrated conceptual knowledge and "misintegrated" knowledge, the theory is merely an invitation to arrogant, dogmatic rationalism. The most impressive part of Anon's reply is where he cites a couple of cognitive scientists to try to support his case, Eleanor Rosch and Jeremy Anglin. That's what most impresses us here—scientific evidence! But is this evidence germane to the issue at hand? Well, I'm not so certain. I rather suspect that Rosch's work is of little use for Rand's case, since her cross cultural work seems to buttress my contention that it is the concept's referents, rather than the concepts position in a typological hierarchy, that is most important. And while Anglin's work in child development may have reached some conclusions that coincide, in a vague sort of way, with some Rand's speculations in that department, I doubt whether any of this bears on the point at issue. Keep in mind: I don't deny the existence of Randian hierarchies of knowledge between "wider" and "lower" concepts or that learning begins somewhere within the hierarchy (as it must begin somewhere within it). I'm merely questioning whether a concept's position within the Randian hiearchy (as Van Damme insists) is the critical factor in the cognitive development of children, rather than the degree of complexity of the concept's referents. Van Damme's "The False Promise of Classical Education"
The Objectivist theory of education, as I have noted before, is one of the least objectionable theories in all of Randian inspired philosophy. But this doesn't mean there aren't some serious things wrong with it. Consider, as an example, Lisa Van Damme's essay "The False Promise of Classical Education." Van Damme is at her best when she writes from her own experience as an instructor. When, however, she tries to write as Objectivist, she immediately gets in trouble. What she calls "secular classical education" is seriously flawed because it is too rationalistic. It thinks it can teach children by ramming "floating abstractions" down their throat. It fails because it doesn't take account of the "hierarchy of knowledge," which, or so Van Damme insists, is "absolutely vital to a proper education." There is a necessary order to the formation of concepts and generalizations. A child cannot form the concept of “organism” until he has first formed the concepts of “plant” and “animal”; he cannot grasp the concept of “animal” until he has first formed concepts such as “dog” and “cat”; and so on. The pedagogical implication of the fact that there is a necessary order to the formation of abstract knowledge is that you must teach concepts and generalizations in their proper order. An abstract idea—whether a concept, generalization, principle, or theory—should never be taught to a child unless he has already grasped those ideas that necessarily precede it in the hierarchy, all the way down to the perceptual level. This theory assumes that knowledge is build from narrower concepts, narrower generalizations, on up. Note that Van Damme presents no scientific evidence for her theory. There is a good reason for this. No such evidence exists. Human knowledge is not built up from narrower to wider concepts. Calculus is not a wider concept than arithmetic. It simply describes a more complicated subject matter. It's the sophistication and complexity of the subject matter, not the width of the concepts, that's hierarchical. We can easily refute the Objectivist theory of the hiearchy of knowledge with the following cognitive experiment. Let's create an Objectivist hierarchy of concepts, going from higher to lower, starting with a breed of dog (which we will assume, for argument's sake, to be the narrowest concept possible), and going up the hierarchy all the way to the concept animal. The hierarchy is as follows: doberman, dog, wolf, Canidae, Carnivora, mammal, Vertebrata, Chordata, Animalia. This is, of course, not a complete hierarchy, but it's close enough for our purposes. If the Objectivist theory is correct, a child should learn the concept doberman before he learns the concept dog, and the concept Canidae before he learns the concept animal. As a matter of fact, as a little empirical work would soon demonstrate, a child is more likely to begin forming concepts of animal and dog long before he forms concepts of doberman and Canidae. The initial conceptions of infants and toddlers, as far as we can tell, are not necessarily "low level," "concrete bound," or "perceptual," as Objectivist theory posits, but tend to be on a fairly general level from the very start. There's every reason to believe, as Hayek argued in his essay "The Primacy of the Abstract," that very young children (and animals as well) think largely in terms of broad generalizations, and that maturation of thought in the human species involves the ability to make very fine distinctions so that our conceptions become much richer and cognitively powerful over time. Hoisted from Comments: Don't Try This At Home! "I've spent untold hours trying to convert the precise sounding CCD into a computer language for A.I. applications. I stared at her definition of CCD trying to extract every possible meaning. And really when you move beyond tables it leads nowhere. It doesn't even handle tables. In the end it is profound sounding collection of words that can make the one think that words and concepts are now mathematically precise. But this really isn't the case. She just means "similarity" as this website points out." Over Objectiblog way, Neil Parille makes another sharp-eyed catch. The 'mind/body' (or perhaps better called the 'mind/brain') problem is perhaps the toughest problem in all philosophy. Once again, there is an impression abroad that Rand somehow solved this issue, or even made some important contribution to it. Unfortunately, this again turns out to be false. "I want to stress this; it is a very important distinction. A great number of philosophical errors and confusions are created by failing to distinguish between consciousness and existence -- between the process of consciousness and the reality of the world outside, between the perceiver and the perceived." "So, yes, I'm a dualist. Or as Leonard [Peikoff] says in OPAR, because the term dualism is not one we have to fight to save and it's so associated with Descartes, the proper word for it is: Objectivism, not dualism." "When asked whether “the relation of conscious activity to brain activity” is “a scientific question,” Rand simply replies “Yes” (Rand 1990, 290)." Well, if the mind/brain problem isn't a philosophical question, then what is she on about then? According to Rand, the philosopher's proper role is only to "define the terms in question." Never mind the problem, worry about the words! Who needs philosophers, one wonders, when you've got dictionaries. Objectivism's verbalist priorities and scholastic method are once again obvious. "The precise nature of a theory of mind compatible with Objectivism...has yet to be established." Now I realize that tuition fees for private colleges are often enormous, but why would anyone want to pay out such an exorbitant sum to an institution that won't even come clean on its obvious ARI links and which, perhaps even more critically, has no track record to speak of—none whatsoever? Why would anyone, even someone sympathetic with ARI, take such a financial risk, particularly when you consider that there exists no guarantee that a degree from Founders will have any value at all in the job market? Two new faculty hires at Founders College; predictably both are Objectivists, and A.R.I. fans. The first is self-styled "rogue psychologist" Scott J Adams, previously touted as a guest speaker at Founders and now a full-time hire. 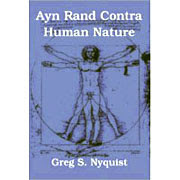 Adams talks about the "brilliance" of Ayn Rand's contributions towards "a rational and objective" psychology. His website contains Objectivist links to only A.R.I.-friendly sites. The second is Jena Trammell, teaching Literature. Trammell's writing appears in A.R.I. endorsed books such as this, as well as the A.R.I. 's Capitalism Magazine, where she appears reviewing a book by novelist and A.R.I. guest writer Ed Cline. This now makes a full 2/3rds of the faculty ARI-flavoured Objectivists, up from the previous 50% composition, making it hard to countenance claims that Founders is moving away from the initial idea of being an orthodox Objectivist college towards a more mainstream position. If anything, the reverse seems to be happening. Also notable is the uniformity of Objectivist orientation - there seem to be no Objectivist faculty members affiliated in any way with the A.R.I's arch-rival organisation The Atlas Society/Objectivist Centre. It looks awfully like a policy in action, which raises other issues. For example, if, as is rumoured, Founders offers a minor in Objectivism, will TAS/OC thinkers like David Kelley be included for study? ARCHNblog is offering excellent odds right now that, in the unlikely event Founders should ever give a direct answer to a question, that answer would be "no." All this once again flies in the face of recent strong denials of any Objectivist influence from both Founders founder Gary Hull, CEO Tamara Fuller and Dr Robert Garmong, and denials of any A.R.I. link from anonymous commenters. ARCHNblog has also put some of its Literature related questions to Dean of Faculty Bryan Niblett, and, following Professor Garmong's advice, to Founders' designated PR firm. As yet we've had no reply. We'll keep you posted. A handy, ongoing list of fact-free beliefs about Ayn Rand's intellectual achievements. Rand is widely believed by her followers to have solved most of the major philosophic questions. For example, she is thought to have answered what has come to be known as Hume's "problem of induction." Prof M:"The question is: where does one stop? When does one decide that enough confirming evidence exists? Is that the province of the issue of induction? As anyone capable of unbiased judgment can readily perceive, Dr. Garmong has not in fact answered the questions posed to him by ARCHN blog, nor is it likely he ever will. How can he? Founders College was originally conceived on Objectivist principles. How else can you explain a reading list that is almost exclusively made up of books cited by Rand? Or consider Professor Garmong's statement about Founder's College mission, which he says is "to provide liberal-arts education in an integrated, hierarchically organized curriculum." (Emphasis added.) The terms integrated and hierarchically are Objectivist buzzwords. Rand and her followers are always stressing the importance of integration and hierarchy in knowledge. So the Randian roots of Founders College are difficult to deny. Why not simply own up to it? Why do orthodox Objectivists have so little credibility outside of ARI? It stems, at least in part, from their unwillingness to own up to their mistakes or respond to any of their critics, particularly the critics of their management (or rather their mismanagement) of the Objectivist movement. Now I, as a critic of Objectivism, see very plainly that the mismanagement of the Objectivist movement stems from problems with the Objectivist philosophy. The Objectivist conviction that human beings are the products of their philosophical premises, which influences how ARI goes about the business of spreading Objectivism, is just plain wrong and can only lead those who believe in it to frustration and grief. In a sense, there is a kind of justice in the scandals of Objectivism. Bad ideas, if earnestly followed, must lead to bad consequences. Yet there is a tragic element apparent here as well. After all, not everything about the Founders College is ill-conceived. Dr. Garmong insists that "students will be educated on ... all of the major ideas, not just Objectivism." The reading list, though it includes some howlers (like Calumut K, for instance) also includes Doestoevsky, Tolstoy, Balzac, Hawthorne, Mann, and Dreiser. Whatever the deficiencies in the Founders curricula and in its staff, it is likely that the handful of students going there will receive a better liberal education than they would if they pursued a humanities or social science degree at most American universities. But in the end, it will all come to nought, because Founders cannot possibly succeed if it is run by orthodox Objectivists who won't even come clean as to what they are about. The biggest question about Founders has to do with how non-Objectivist ideas will be taught. Orthodox Objectivism has a very poor reputation when it comes to presenting ideas of philosophers Rand disagrees with. Just consider what Rand and her orthodox followers have said about Hume and Kant. Rand sympathizers like George Walsh and Fred Seddon have become pariahs among orthodox Objectivists for trying to correct Rand's misconceptions about other philosophers. Why should we expect Founders to present fairly and honestly non-Objectivist ideas when there is little if any evidence that orthodox Objectivists are even capable of understanding, let alone articulating, non-Objectivist ideas? lists, we would find nowhere near the similarity. Given your claim that there is absolutely no Objectivist orientation to Founders curriculum, how do you explain this remarkable coincidence? answered? If yes, by whom? successfully answered? If yes, how and by whom? Thank you for your questions. I understand your concerns. After some bitter experience, Founders College has adopted the policy of directing all media inquiries to our public relations firm, Deeter USA. You may reach them at http://deeterusa.com/. Thank you for your interest in Founders College. I'll leave it to readers to decide whether Dr Garmong's letter or blog actually answers any of ARCHNblog's questions above.